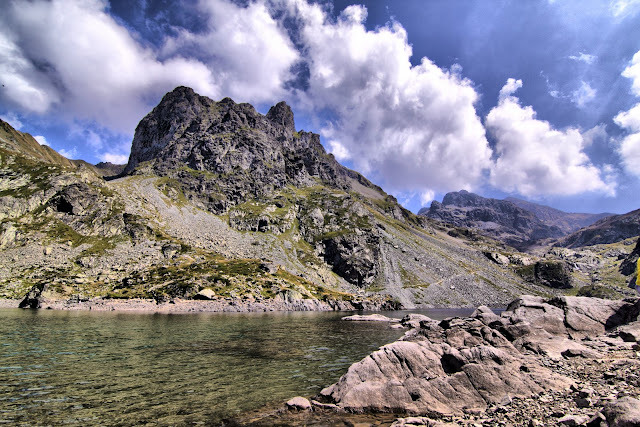 This hike starts at a car-park at 1300m, and first climbs steeply to Lac Crozet at around 2000m. At that point, you could spend the afternoon by the Lac, then hike back down; or continue up into the Belledonne on GR549 over the Col du Loup at 2400m, down to Lac de la Grande Sitre, then back round to the parking spot. By my estimation the full route is around 14km. There are two parking spots on the road, although once you pass the first one, the trail gets somewhat rocky, and there are very few passing places. I’d go for the lower one if you don’t have a 4x4, or if it looks like there’s lots of cars already parked up. As per the title of this post - I’ve planned but not attempted the full route - created using Google Earth and an IGN 1:25,000 map. I have been up to the Lake and back (not the full round-trip, because we started a bit late).